It didn’t really seem like I did much sketch-booking this year until I sat down to compile this post. In 2018, I made 37 drawings in two different sketchbooks. Considering one finished drawing can take anywhere from a few hours to a few days, that’s not half bad! 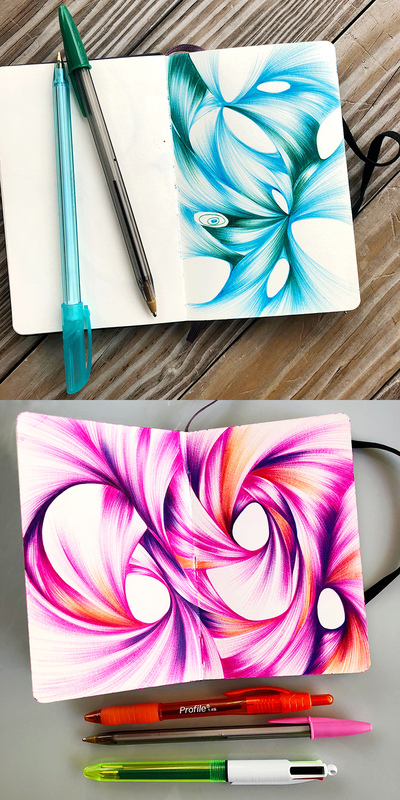 After drawing exclusively in the the standard 5" x 8.25" size Moleksine sketchbook for many years, I started using the ultra portable pocket size again as well. At just "3.5" x 5.5", the tiny Moleskine was perfect for all of the traveling we did this year, especially our trip to Switzerland! So that you can quickly view all 37 drawings, I created a short video, showing each sketchbook spread in chronological order. Just click that arrow on the image below to watch. Looking back at all of the sketches I made this year, I recognized some patterns and themes in my work. I’ve also noticed how my style and technique change over time. I used a lot of true blue. I actually did 5 drawings in just blue. I’ve always been drawn to the color and Bic blue pens are incredibly easy to draw with. I also had a chance to try out the Baux Pen 2, a new ballpoint pen body that works with Bic pen parts. It's solid and feels good in my hand. At first it felt a little heavy, but after a while I really liked that weight. It seemed to give me more control. As the year progressed, more “holes” appeared in my drawings. Negative spaces really made a comeback in my work this year. I can’t tell you why, they just did. If you’ve been following my art journey for a while, you’ll recognize these shapes. Florals have been a reoccurring theme in my work forever. I don’t know what to call these, but I like them and I’ll keep making them. This concludes our 2018 sketchbook tour. I hope you enjoyed it. I sure enjoyed looking back at this year of work. It makes me excited to do even more in 2019. Do you have a favorite drawing of mine from this year? P.S. 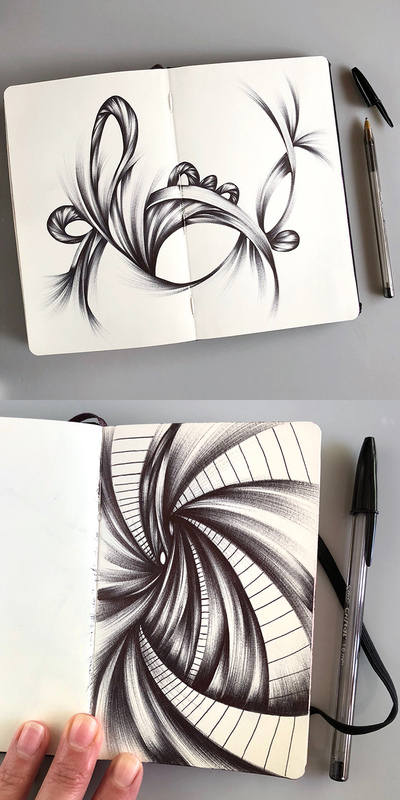 If you’d like to learn my ballpoint drawing techniques, check out the “Jen & Ink” e-courses. 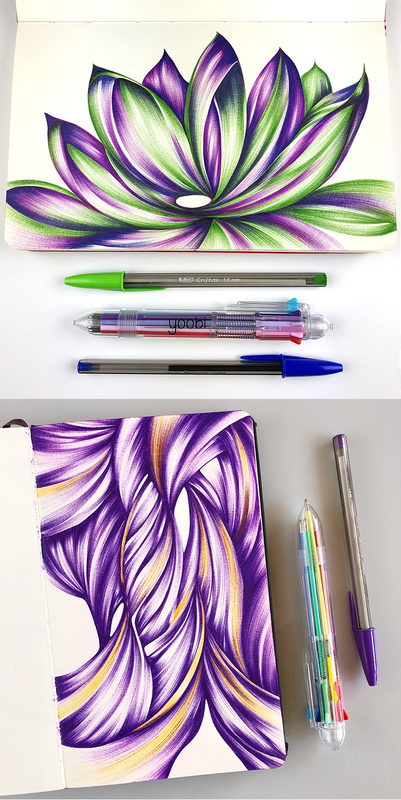 In my two self-paced courses, I share my ballpoint pen drawing secrets and techniques. I’m in the home stretch of finishing up my newest e-course. My newest drawing course is coming soon. My lovely mailing list members will be first to know when the course is live. Click to join now! New E-course will be live soon! “Jen & Ink in Color” is a companion course to the original “Jen & Ink” course. I dive into color and how to harmoniously work two or more colors together in a composition. I’ll be tackling all sorts of color schemes including complementary colors, analogous colors, triads, and how to successfully incorporate black and brown into drawings without overwhelming. Want a sneak peek of the first lesson? In this lesson, I discuss the color wheel and color theory. Knowing how colors work together (or don’t work together!) is an important part of any work made in color. The video gives a nice overview of the content of Jen & Ink in Color. You’ll see all of the color schemes that I will demonstrate in this course. Take my first course, “Jen & Ink!” You’ll want to take that one first, as they build on one another. Already taken Jen & Ink? Be sure you’re on the mailing list. My lovely mailing list members will be first to know when the course is live and will be able to purchase the course at a discounted rate! Gotta go work on my course. Ciao!